Welcome to Navy Cove! 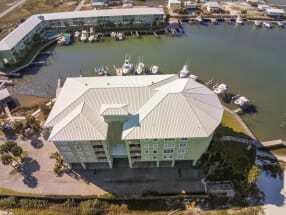 This gorgeous condominium complex is not far from the beach at all here in Fort Morgan, Alabama! Our properties here at Emerald Coast by Owner offer you an outstanding view of the coast and are equipped with a number of amenities. We offer you a great amount of luxurious properties right on the water with a community hot tub and pool! The view of the harbor is one not to take for granted, come on down and enjoy yourself! While our properties and amenities are some great assets to staying here, you don’t want to miss out on the area’s attractions and local activities! People love to go parasailing, deep sea fishing, paddle boarding, golfing, racing go karts, renting jet skis, helicopter tours, Fort Morgan State Historic Site Museum and so much more! When it comes to food down here, you’re in luck! There’s an abundance of delicious eats whether seafood or traditional food in a fun scene with excellent service and drinks! Browse our Navy Cove listings below, be sure to click the email owner button found on each listing to send a message to a property owner directly. Booking direct with the property owner or manager allows you to get answers to your questions before you book and assures you are getting the best price for your vacation rental. Book online today with ECBYO!